Heather:	We should just be dancing. No, this is stupid. You have to stop it. Heather:	Hey guys! This is Heather from healthyeatingstartshere.com. I am outside in snow and Phil’s with me. Whoa! Oh my God, we’re in the same video. It’s craziness. Heather:	So, first of all, we just wanted to say a big huge thank you to all of you. Mostly because the other day my YouTube channel got 215,000 subscribers, which I think is crazy; crazy and awesome. Heather:	Yeah. How many subscribers do you have? Phil:	Almost a thousand. But I haven’t been focusing on YouTube yet. Heather:	Right. Okay. So, moral of the story is you shall go subscribe Phil’s channel, so you can watch him. Heather:	So, end of the year always a good time to look back on what you’ve accomplished. So, 2012, for me, was about building relationships with you guys, with other vegan and health professionals through my Better Health Summit, through going to conferences, and it was also having a lot of fun, for me. I tried to do videos where I had really just a lot of fun and still give information, but do it in a fun way. So, like my Top 10 list. Heather:	My butter substitute and cooking oil makes a fantastic moisturizer. Phil:	Especially in the last few months, you’ve been doing some cool stuff I think. Heather:	Yeah. Fun. What have you got going on? Phil:	— called Building Soils Naturally. Phil:	Beautiful cover, good writing too. Phil:	That was put out in December. Phil:	Yeah, you did edit it. Phil:	That’s right on your hair. Phil:	So, we’re kicking off 2013 with brand new websites that I’ve been working on for the last couple of weeks, over Christmas. Heather:	He’s been working really hard. Phil:	A little new musical intro to the video. Heather:	Yes. We’re going to put on this video, right? Heather:	So, you’ll already have heard it. Phil:	It’s just a simple little thing. Heather:	But I like it. Phil:	New logos, that my buddy Matt Paren designed for us that are so nice. Heather:	Yes, it’s beautiful, check out the top of the website. If you’re on YouTube go over to the website, you’ll see it there. Phil:	And just the new website that are going to be updating the technology, easier to navigate, little pretty hopefully, and especially on small devices they should work nicely. So, the most exciting thing for 2013 is something we’ve been working on for a few months, at least. Phil:	It’s coming out next. Heather:	Oh, my god! Yes. Okay. So, I’ve been working on this for a long time and I’m super excited about it. I want to share it with you guys, it’s a new project. What can I say about it? Phil:	They’ll find out this week. Heather:	I can’t tell you yet. Heather:	So, if you’re not on it already go sign up on my email list healtheathingstartshere.com. Heather:	You can do that while you check out the logo. Phil:	Yeah, which everyone is dying to see our logo. Phil:	Then what are we doing? Heather:	Then, in a couple of weeks we’re going to Peru for three months. Heather:	I am excited because, you know what they have there? A whole ton of fruit and quinoa. Phil:	— fresh ripe fruit the way it’s supposed to taste. Heather:	I am so excited, I really am. Phil:	Okay. So, quickly, for me, because this video is maybe getting long. So, for me — for my followers in 2013, I’m — the Academy is largely done, but I’m going to be going back through and improving some of the videos. Some of the — some videos where I’m just doing this, standing in front of a camera, because it’s hard to always show things. So, I’m going to film, 25% to 40% is what I’m taking of the videos over again make them even cooler. I know it’s — people are giving me great feedback already, but I just want to — 2013 is going to be just like making the Academy even cooled that already is. And, for blogging, it’s going to be the year when I — I have a really cool strategy for blogging. It doesn’t mean I’m going blog more often, but I just think it’s going to be really cool what I’m doing. I’ll be talking about that more later. Phil:	Maybe, depending on how you feel after this video, we will be doing a little more things together this year. We haven’t really talked about that. I’m springing it on you right now. Heather:	Okay, we’ll see. What do you guys think? Heather:	No. Here you go. Phil:	No, it’s — we haven’t told each other, so that’s good. Heather:	Not yet. Okay, I want to know what else you guys want to see from me in 2013. So, if there’s anything leave it in comments. Phil:	I want to know that too. Heather:	Great. Okay. And it looks good. Heather:	I am done. Are you done? Phil:	I want to go play in the snow. Heather:	Okay. Oh, no he attacked. Phil:	Here can you make a snow angel? Heather:	You can’t make noise before you come on. Phil:	Hey guys, this is Heather from HealthyEatingStartsHere. 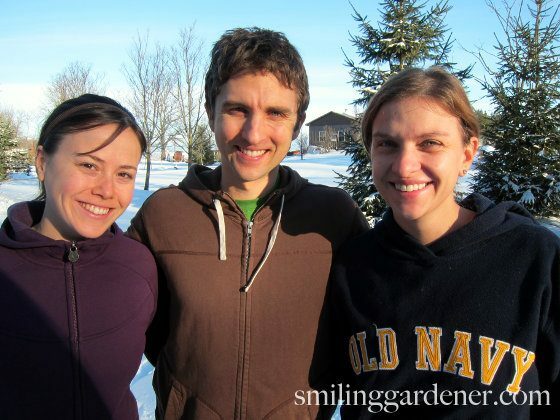 I thought it would be fun to update you on what’s been going on at SmilingGardener.com in 2012 and what I’ll be up to in 2013. First, thanks to everyone for your support, for leaving questions and comments on my blog or sending me an email. I can’t respond to most emails, but I do really appreciate your enthusiasm for organic gardening. I’m having so much fun putting this information together for you and the feedback I get is what keeps me going. 2012 was an awesome year. We did a bit of traveling to the eastern U.S. and the western U.S./Canada to attend some conferences and visit some movers and shakers and friends and family. Academy. Most of my time this year (and in 2011, too) was spent on creating text and videos for the Smiling Gardener Academy, my 12 month online gardening course. Just before Christmas, I wrapped up filming most of the last few months of the course. I’m going to be planting a bunch of berries and some other fruits in the spring, so I still need to record that for month 12, but “principal photography” is largely done. Book. The exciting news from the summer was that I put out my book Building Soils Naturally, published by Acres U.S.A. I’m very proud of it and the emails and book reviews I continue to receive from around the world are incredible. Blog. The Academy has been a pretty huge undertaking, so I’ve always felt that the articles and videos I put out for free have taken a bit of a back seat since I launched the blog in late 2010. I’m happy with what I’ve done, but I’ve always struggled with figuring out how much to put out for free and how much to save for Academy members, so thus far almost everything goes into the Academy. Sister. My sister started helping me out a few hours a week with a little editing and shooting some videos, but mainly she’s doing most of my social media stuff like facebook and google plus. She’s much more extroverted than me, so that’s really her thing. 2013 looks like it will be even awesomer. We’re heading to Peru for 3 months this winter. In fact, one of the main reasons we decided 3 years ago to start a website was so we can go anywhere in the world where there’s an internet connection and still work (incidentally, although it may sound extravagant, it’s not like you need a lot of money to do it – our rent will be half as much in Peru as it is here). Website. To kick off the year, I’ve spent the last couple of weeks redesigning our websites to update the software and make them a little nicer to look at and navigate, including on devices likes iPads and iPods. I even recorded a new simple music intro for our videos, and my buddy Matt Pearn made us new logos that are just perfect. Blog. This year I’ll hopefully finally have the time to get a bit more of a blogging plan going. It doesn’t mean I’ll blog more often, just that I have more of a plan for how to do it and hopefully it will be a little more polished. Plus, I have a couple of extra freebies in the works for you guys. Academy. Now that the initial filming is done, I get to go back through to improve the course. To me, the only downside of the course right now is that there are certain videos where I’m basically just talking into the camera because it’s difficult to always have something hands-on to show. But I think I can find ways to get more interesting visuals in those videos, so I’ll hopefully update at least 25% of them this year. Heather. I’ll also continue to spend a lot of time working on Heather’s two websites and all of the fun things we do over there. We’re actually putting out a new incredible (really incredible) Healthy Meal Plan resource this weekend that we’re both super excited about, so check that out if you could use some help with planning and cooking your meals. It’s been many months in the making and the response since we launched last night has been far beyond what we expected! For today, I’d be really interested to hear about your goals for 2013, whether gardening-related or not. Let me know below. I’m interested in experimenting with shade cover over much of the garden to block out our extreme Texas heat. It is so hard to grow things in 100+ degree temps, so I was wondering if high tunnel hoop houses covered with a shade mesh (not sure what percentage of shading it should be) was a good idea. I would love to possibly shave off a half a mark or so from our hardiness zone by doing this. Thoughts? I live in zone 8b right now (Central TX- Austin area) and wondered if it would be beneficial to invest in the cover. We have a huge garden though, so it will take quite a fair bit of money to do so.My other goal is to finish a stone surrounded series of beds in my ‘Zen Circle’ in the center of my garden. It will be a center circle with a couple of rows of concentric circles around that, with walkways in between. I hope for mostly herbs, medicinals, a few perennials (flowers too) and maybe some Egyptian walking onions in that special garden. Renate, I’m also in zone 8b. 2011 was awful and I’d say 50% of my garden just burned up in the hot sun. But 2012, in half our raised beds, we installed drip irrigation, worked in a couple inches of good compost, then mulched with water soaked newspaper (8 pages thick of black and white paper only) shreded leaves and straw. These beds thrived despite the continued drought and heat, and we didn’t lose a single plant. Spent much less time weeding and the bugs were not as bad as usual. Today we’re expecting LOTS of rain, as you are also. I think we are finally pulling out of the drought! Yes, the shade cloth over hoops is an excellent idea. My advice would be to start small for a season and see how it compares to a control group that isn’t under shade.Love the zen circle idea. You might want to look into the labyrinth concept – for some reason, walking a labyrinth seems to improve health and healing quite tremendously in some people. Thanks for all your hard work Phil. I love everything you and Heather do and can’t wait for more academy this year. Today I’ll harvest the remaining cabbage, then put the last of our raised beds to rest ’til spring. I’m experimenting with elbon rye, to reduce nematodes. Not sure yet if I’ll till it in, or try a no-till on that bed. I’m also in zone 8b in East Texas, and while the heat and drought hit us hard, found that drip irrigation and mulching helped my plants tremendously. My garden gets better each year, mainly because of the Texas Master Gardener program and great information I’ve found available on the internet, including the Smilinggardener Academy Thanks for all your work on the academy! Thanks Jeanne! How will you knock down the rye if not through tilling?